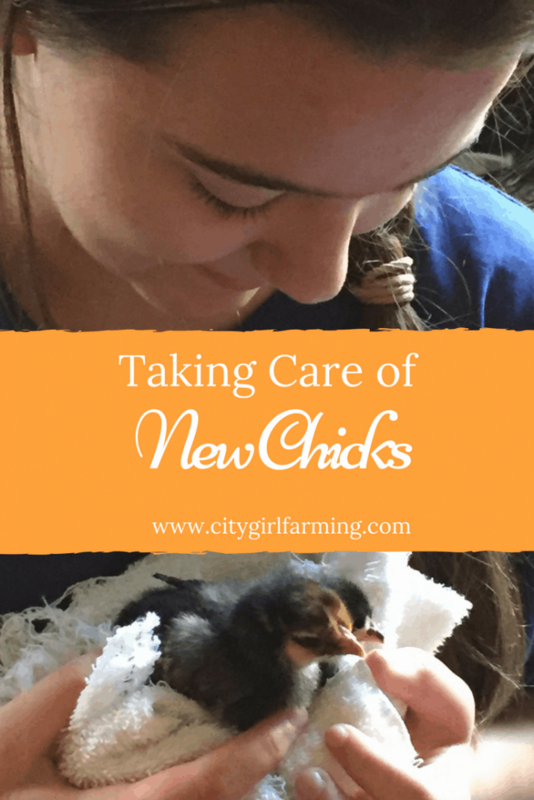 Are you ready to start taking care of new chicks of your own? It does require a little thought and planning, but there’s nothing to be afraid of. In fact, jumping into chicken ownership is sure to change your life, in lots of unexpected ways. 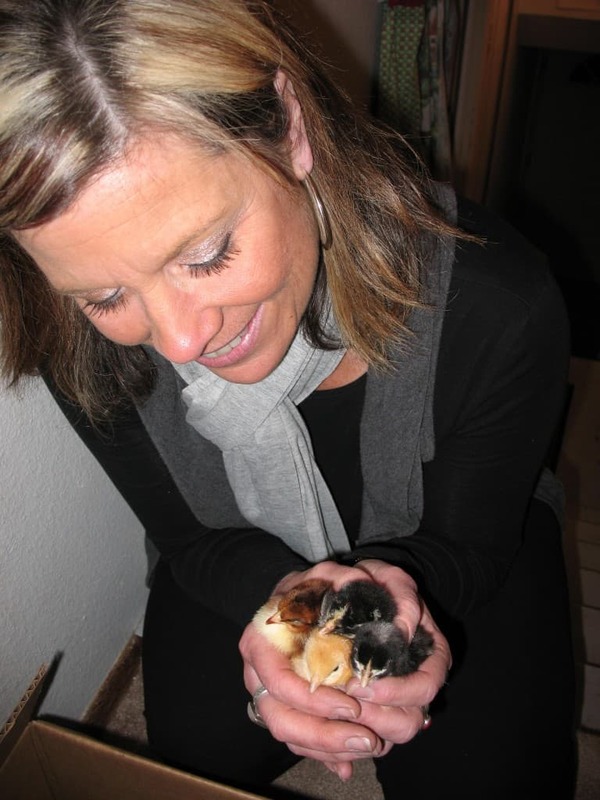 What is cuter than a newborn baby chick? ?…That tiny fluff ball that fits in your hand, peeping little peeps. Although baby chicks have some basic needs and are a bit fragile (as most babies are), with little effort, you can successfully raise your chicks into full-grown birds–whether you want them for pets, eggs, meat or a combination. Are you ready for babies? Before anything else, check to see if chickens are allowed where you live (cities, HOA and other places may have rules you have to abide by). Find out how many chickens are allowed as well as any rules they have about the coop (when I lived in the city, my coop had to be a certain number of yards away from neighbors as well as from the front sidewalk, for instance). Once you decide how many chickens you want, calculate how big your hen house and chicken run need to be in order to accommodate the number of chickens you will buy. Finally, decide on the breeds of chickens you’d like to raise and figure out where to find them (local feed store, mail order, etc). 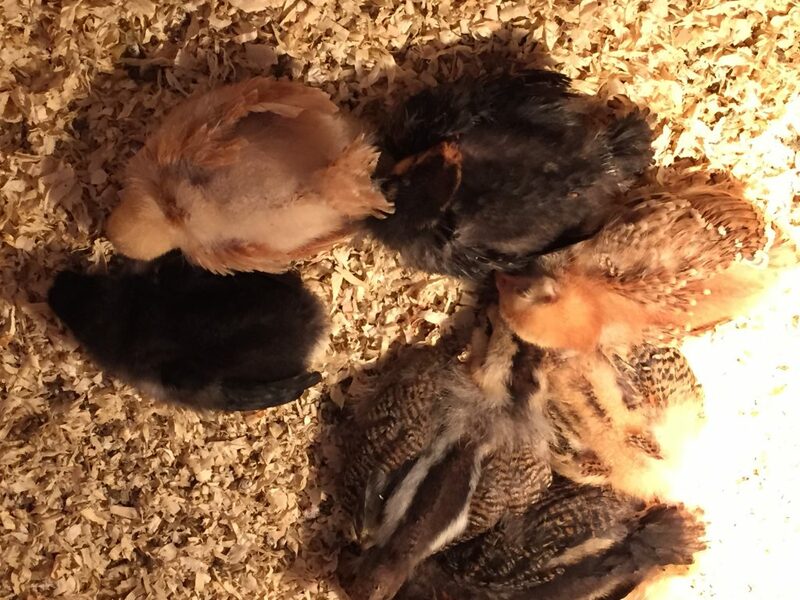 For the first 6-8 weeks of your new chicks lives, they need to live with you. Yep, that’s right. They’re temporary indoor pets (yes, the garage will work as well if it’s warm enough). The reason? Until your baby chicks fully feather out, they can’t regulate their body temperature. The fluff is cute, but of zero help in keeping them warm. (Here’s more info on setting up a brooder). A perfect way to house new chicks in those initial weeks is in a big box (a free appliance box from a home improvement store works great), an extra large plastic bin (with a screen over the top–especially if you have other indoor pets roaming around that might like nibble on the new little babies) or a large sized dog crate (see pictures below). Line the bottom of your box with pine or wood shavings or other materials. Change the shavings occasionally to keep the area clean (and the smell down). Stay away from using bedding such as newspaper, cardboard, plastic, kitty litter, cotton batting, leaves, straw, hay, cedar shavings or dirt. Some of these substances cause lung irritation, others could potentially swell inside their fragile little stomach causing issues, some may contain harsh chemicals or mold that aren’t good for them at such a young age. Slick surfaces have the potential of causing spraddle legs (a condition where the legs slip out to the side making it difficult to walk). A Heat Lamp for Warmth. 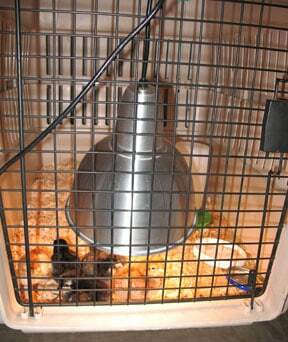 You’ll also need a heat lamp or other chick heating device (such as a Brinsea EcoGlow). Hang the heat lamp over the box where your chicks are. Here’s how to know if you have the lamp at the proper height: if the chicks are still too cold, they’re huddled together. If they’re too hot, they’re as far away from the lamp as they can get. Your new babies need clean water and food at all times. Be careful, especially with the water…don’t give them water in something too deep…you don’t want them to drown. If you keep your new chicks warm, fed and watered, you’re off to a good start. The only other major thing you need to watch for is their backside–make sure that it doesn’t get clogged with poop (and stop up your chick which will kill it). If this happens, the solution is a simple one: Take a warm, wet cloth and gently remove the poop caked on your chick. Handling your chicks will help them grow up to be tame pets. Handle them often, but don’t forget to watch your hands BEFORE (to protect them from your germs) and AFTER (to protect you from their germs). Most chickens, by nature, are gentle creatures. Get them used to being handled early and they’ll grow into tame, wonderful animals. PS Prepare for awesomeness!! 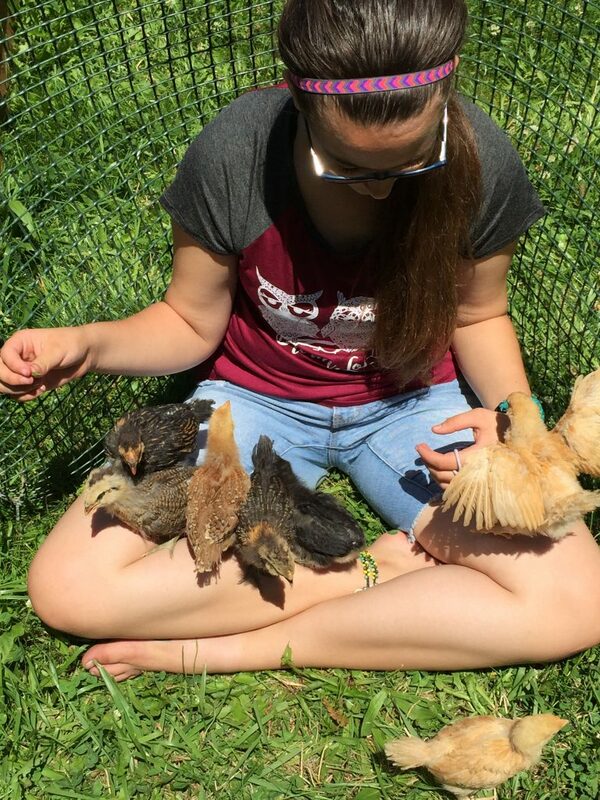 Adding chickens to my life was one of the best things I did–EVER! Don’t believe me? Here’s 20+ ways your life is gonna get better!